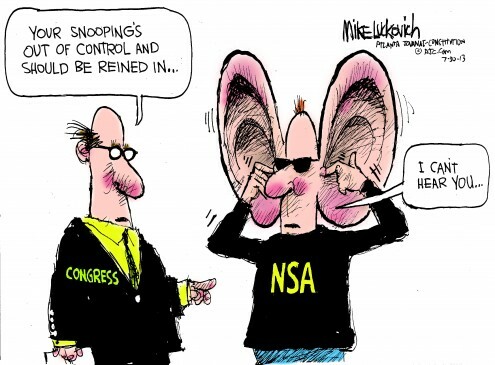 Golf Time is Over, What’s the President Going to do with Snowden and the NSA? New Orleans Ok, we’re off of vacation now, and making our way back to work to grudgingly greet or growl at a new year. Our teams won or lost and we’re waiting for the playoffs. Winter’s not coming. It’s here! Time to crack back at it again. The President seems to have had a good vacation in Hawaii. No doubt well deserved and reportedly involving a lot of golf, so if anything he’s probably so bored he’s ready to embrace the New Year just for something to do to get his heart beating again. The special panel he appointed has said clearly, “Dial it back, dude,” but surprisingly the President before his Aloha week did not seem to be embracing that alternative as fully as we should have been able to expect. Granted we have some division in the court rulings about even whether or not this mass vacuuming of everything telephonic is even legal, but 2 judges out of three have said, no way. Heck, the New York Times editorial board even joined the call, and, yes, I said this a while ago, that Edward Snowden, the NSA leaker, should be given amnesty or allowed some kind of softer landing on a plea bargain because he has done the country a huge service. Embarrassingly for the President, they also pointed out that his gratuitous, and no doubt scripted, comments earlier that Snowden should have blown the whistle on the NSA rather than copying, pasting, and running, were wrong because contractors like Snowden are not protected as whistle blowers, and further than Snowden has indicated that he twice told supervisors, not that any of them cared because contrary to common sense, American traditions, and most believe the constitution, they might have wrongly thought it was all hunky-dory and legal. If we’re going to start a New Year off right, how about doing it without government spying and by showing some mercy to a guy who took the big steps to wave his hands in the air and tell us something was way wrong at the NSA. This entry was posted in Ideas and Issues and tagged Affordable Care Act, Edward Snowden, nsa, President Obama, spying by Wade. Bookmark the permalink.